How might one go about rewriting the following rhythm into a time signature of 12/8? 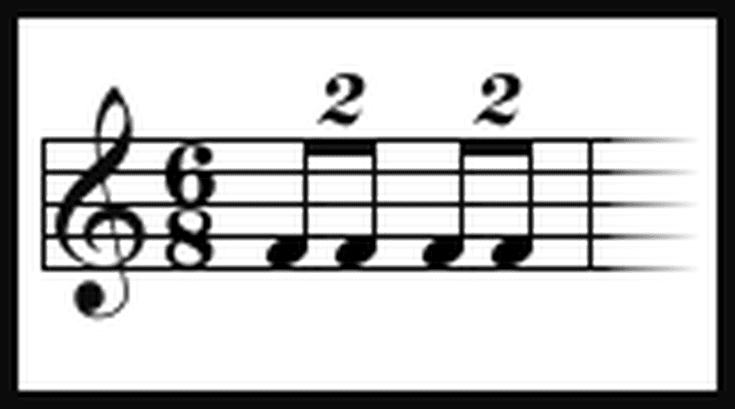 I initially figured we could just notate each set of beamed eighth-notes with 4:6 above them to indicate that four notes should be played in the span of 6. However, I'm not sure if there's a more proper way to indicate this and if that'll work because the last note is tied across the barline. You can do this two ways. I don't think beaming in fours would add to the clarity, but I wouldn't shoot you for doing it! For the effect to be the same in compound quadruple time, it would be two notes in the time of three 4 times ie four sets of duplets. So, in other words, this times two. Not the answer you're looking for? Browse other questions tagged theory notation rhythm time-signatures tuplet or ask your own question. How can a 59/48 time signature be counted? 13/8 notation: how many bar lines for readability? What is the time signature of this piano rhythm?